Self-consistent axisymmetric rotating models: Following general statistical mechanics considerations, we constructed a family of rigidly rotating models defined as an extension of the King models to the case of axisymmetric equilibria, flattened by solid-body rotation. The relevant distribution function depends only on the Jacobi integral associated with the internal rotation; the structure of the models is determined by solving the relevant Poisson equation with the same perturbation method discussed for the tidal models, since the corresponding singular perturbation problem is formally equivalent. In addition, we also considered a second family of models characterized by differential rotation, designed to be rigid in the central regions and to vanish in the outer parts. In this case the relevant Poisson equation is solved by a spectral iteration method, based on the Legendre expansion of the density and the potential. A full description of the photometric and kinematic observables has been provided and the models in the moderate rotation regime are particularly suited to the description of the observed rotating star clusters. 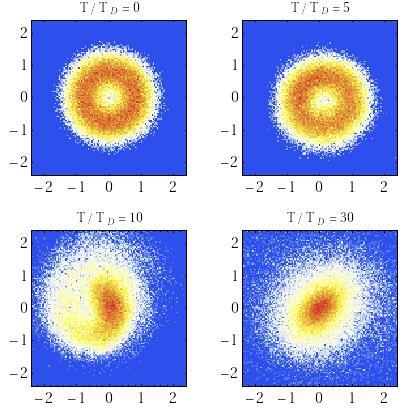 For general interest in stellar dynamics, we also studied the models in the strong rotation regime, which tend to show a central toroidal structure. Observational signatures of internal rotation in Galactic globular clusters: A detailed dynamical analysis of the photometry and three-dimensional kinematics of globular clusters ω Cen, 47 Tuc, and M15 has been performed by means of the differentially rotating models. The comparison between models and observations is structured in three steps. First, we determine the dimensionless parameters by following few natural selection criteria based on the observed kinematics, with particular emphasis on the signatures of differential rotation; then, we proceed to set the physical scales by means of a few standard statistical fits. Finally, we check some properties of the models as predictions in relation to other observational data not used in the first two steps; in addition, an estimate of the dynamical distance is also provided. We find that the well-relaxed cluster 47 Tuc is in excellent agreement with the model and internal rotation can naturally explain the observed ellipticity profile. For M15, we provide a global model in good agreement with the data, including the central behavior of the line-of-sight rotation profile and the general behavior of the ellipticity profile. In the case of ω Cen, the selected model is able to reproduce the complex three-dimensional kinematics, with an overall agreement with the observed anisotropy profile, which is characterized by a transition from isotropy, to weakly radial anisotropy, and tangential anisotropy towards the outer parts. 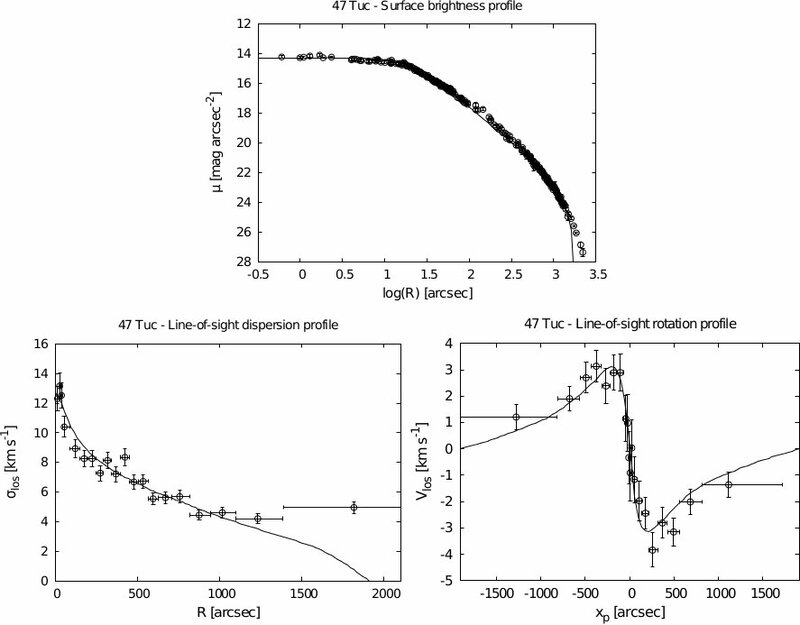 The discrepancy observed in reproducing the steep central gradient in the line-of-sight velocity dispersion profile should be related to the condition of partial relaxation of this stellar system. M13 as a case study for the link between internal rotation and multiple stellar populations: A recent spectroscopic study by Johnson & Pilachowski (2012) clearly demonstrated the existence of three distinct stellar populations in M13, making it a perfect target to investigate the possible existence of a link between internal rotation and multiple stellar populations in globular clusters. Our dynamical study of M13 includes 1) detailed morphological characterization, by means of the two-dimensional isophote map, radial profile of the ellipticity, inertia and quadrupole moment tensors of the projected image and 2) full kinematical investigation, to assess the relative importance of internal rotation with respect to random motions, by means of two-dimensional velocity map, rotation curve, and radial profile of the velocity dispersion. A rich and well-distributed sample of radial velocities of RGB and AGB stars of the cluster has been collected by a member of our team over the past decade and is available for our study. Dynamical stability of differentially rotating stellar systems: By means of specifically designed N-body simulations with a direct code (Starlab, see Portegies Zwart et al. 2001), a full stability analysis of the family of differentially rotating models has been performed. As expected, configurations in the moderate differential rotation regime are found to be dynamically stable. Curiously, there also exists an intermediate rotation regime in which the systems exhibit a central toroidal structure and are dynamically stable. In turn, a new dynamical instability, characterized by a variety of unstable Fourier modes of the density distribution, is observed in models with high degree of differential rotation, in striking analogy with recent stability analyses of differentially rotating fluids with polytropic equations of state (Centrella et al. 2001; Saijo et al. 2003; Ou & Tohline 2006). The excitation of an unstable mode seems to be triggered by the presence of the relevant corotation point inside the rotating configuration. Surface density maps of the evolution of an unstable rotating model. Long-term dynamical evolution of rotating stellar systems: The long-term dynamical evolution of the differentially rotating models, studied as isolated systems, has been investigated by means of a comprehensive survey of N-body simulations. This study clarifies how the presence of global angular momentum affects the evolution of stellar systems with respect to the traditional paradigm for the dynamical evolution of nonrotating models (e.g., see Heggie & Hut 2003) and extends the results obtained in the context of Fokker-Planck evolutionary models with rotation (see Einsel & Spurzem 1999; Kim et al. 2002, among others). 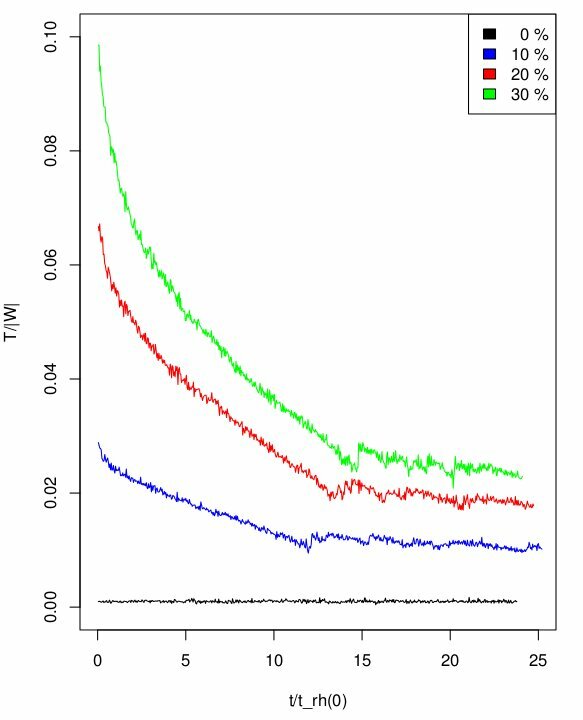 In particular, by comparing the evolution of several rotating models with selected nonrotating models, characterized by the same initial structural properties, we found that rotating configurations reach core collapse more rapidly. Following early investigations (Akiyama & Sugimoto 1989), we also interpreted the evolution of a rotating system by distinguishing between a short initial phase, in which the gravo-gyro instability (Hachisu 1979) takes place and subsequently levels off, and a second phase in which the residual rotation no longer affects the dynamical evolution of the system, which experiences the gravothermal catastrophe and reaches core collapse, as it happens for nonrotating configurations.